After the initial attack on Thursday (Jan 8th), the website was successfully restored. However the attacks were repeated, causing many of the websites hosted by the ISP to become unavailable. One can only speculate as to exactly why the site is being attacked, and by whom. It may be because it provides a count of planes carrying US troops through Shannon airport on their way to/from an illegal war, or because it documents the number of US military planes landing at Shannon and passing through Irish airspace. Or it may be linked to the fact that the website lists the known CIA-controlled planes that have used Shannon airport since August, along with details of other rendition planes that people should watch out for. Another possible reason for the attack is that the website identified a recent landing at Shannon that may be connected to the covert transportation of deadly weapons. Shannonwatch.org highlighted the fact that a plane registered to Kalitta Air landed in Shannon on Dec 20th and again on Dec 22nd. Given that this airline company transported laser-guided bombs for the Israeli bombing of Lebanon in 2006 and that it brought these through Prestwick without the appropriate clearance (see http://uk-airport-news.info/prestwick-airport-news-281106.htm), the presence of its aircraft in Ireland merits further investigation. 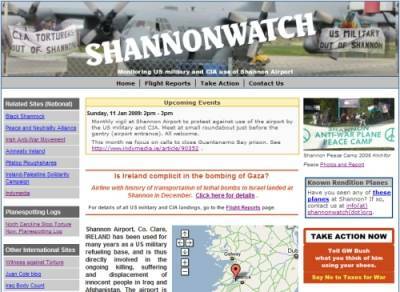 Shannonwatch.org is maintained by Cosantoiri Siochana, which is a group of human rights and anti-war activists based in the mid-West of Ireland. They are now appealing for assistance towards getting the website up and running again as quickly as possible. Mirrored hosting and/or an ISP that can handle large scale malicious attacks may be required; anyone with suggestions or offers of help is invited to contact shannonwatch[at]gmail.com. I've just checked the site and it is not loading. Good luck with it, it's a very worthy project. Stop the War Website also reported an attack. Perhaps not the same kind or intensity, as they have managed to re-direct to another site. We expect to restore normal service soon. Like I said on another item elsewhere, this is now war. This is the activity of fascists. Cyber War is a military /political tactic now. The US military also has Electronic Warfare units and plenty of capability (as do the British, Israelis etc). Obviously you guys are doing some good work that they are worried about what you are publishing. The attack hits on shannonwatch.org are continuing unabated. Nonetheless we are confident of having the site up and running again in the near future. Thanks to our ISP for their ongoing efforts to get us live again. And thanks to the many people who sent messages of support to us. They'll do whatever people let them get away with - keep on resisting the war & rendition flights! Best wishes to you all. Who is out ot get shannonwatch.org? The print edition of the Irish Examiner today has a report on a denial of service attack on shannonwatch.org. The attack is described as sophisticated and seems very targetted. Anyone know more about this, or ways to get around these tactics? The site - link at foot of Tim's post - is still showing as unfindable. We are still trying new ways to get the website back up. In the meantime, some of us are replicating some of the content on blogs etc. Not all of the content can be posted in current format across all forums, but we'll be re-formatting stuff. And there is also a YouTube channel which we will create video content for. An Irish internet service provider has contacted Interpol over a large international hacking campaign apparently targeting a website which monitors US military flights in and out of Shannon. Yesterday, the manager of Web World, David Geoghegan, confirmed a "very well coordinated" attack had affected a number of websites, including the shannonwatch site, and affected thousands of customers. "This is a coordinated attack and it has been going on for the past five days," said Mr Geoghegan, who said he had no affiliation with the shannonwatch.org site. "in 10 years of doing (web) hosting this is the second time I have seen this and it is much more effective than the last one." ... adding that it was difficult to pinpoint who was beihind the attacks as they were originating from internet provider (IP) addresses from around the world, including north and south America. The Government has denied claims by anti-war activists that Shannon Airport is being used to transport US military equipment to aid Israel's offensive. The Department of Transport said airlines carrying weapons or bombs must seek permission to land in Ireland or over-fly Irish airspace and no such permission has been sought for Israel-bound flights. However, anti-war activists claim there has been increased activity at Shannon Airport in recent days and added that a new website logging details of US war planes at the hub has been mysteriously shut down. The Shannonwatch.org site, which only went live last month, was repeatedly attacked by a sophisticated virus which has crippled its server. Limerick-based anti-war activist John Lannon said: "We know that the US has military contracts with Israel and we have to consider that it could be possible that Shannon is being used to transport military equipment for the war against Gaza." Of course, the people at the Department of Transport must be very naive if they think that "no permission" = "no transit". So no permission proves nothing! Would the government please implement a policy that directs customs officials to search Kalitta Air flights and USAF cargo aircraft for undeclared bombs? We are pleased to report that www.shannonwatch.org is up and running again. The attacks continue but the website is now hosted on a platform that we hope can deal with them. We will continue to publish new information on Shannon’s complicity in war and human rights abuse at shannonwatch.org. But as was highlighted in a previous post we will also replicate the important content on myspace, Facebook, http://shannonwatch.blogspot.com/ and other blogs. This will make it virtually impossible to silence us. Shannonwatch.org is largely about making sense of data gathered on military traffic and possible rendition flights through a quiet, out-of-the-way “civilian” Irish airport. But someone, somewhere, is clearly unhappy about this sense making, and about the pieces of the Shannon war-complicity puzzle being put together. This makes us even more determined to continue our quest for accountability and justice, however. We cannot forget that as the hits reign down on shannonwatch.org, the bombs reign down on the people of Gaza. Shannon may be complicit in that bombing, and if it is, we have a sad, dishonourable mark on our collective Irish conscience. And given the history of ministerial corruption, repeated denials over complicity in rendition, ongoing propaganda about the importance of our special friendship with the US, we have every reason to consider the possibility that it is happening. Guantanamo Bay, the illegal Iraqi occupation, Afghanistan, the abhorrent bombing and shelling of innocent Palestinian civilians in Gaza … these are all linked to what shannonwatch.org is about. We challenge the notion that militarization and torture are part of the solution to the threats facing the world today. And we will continue to do so. The US Government flouted British and international law to fly bunker-busting bombs through UK airports to bolster Israeli raids on Lebanon. Washington failed to tell Britain it was flying the weapons in and out of Prestwick in Scotland - potentially putting lives and the airport at risk. The two Boeing 747s, owned by US freight airline Kalitta Air, landed at Prestwick on July 21 and 23 from San Antonio, Texas. They were refuelled and the crew changed before they flew on to Tel Aviv. Kalitta Air regularly works for the US Air Mobility Command - part of the US Air Force - to ship munitions for operations around the world. Documents released under the Freedom of Information Act show that an investigation by the Civil Aviation Authority (CAA) revealed that the aircraft missions did not have appropriate clearance. The Department for Transport document says: "There was no record of any application being received by the CAA for such an exception and consequently the conditions that would have been applied to safeguard persons and property at Prestwick were not in place." So much for the Irish Department of Transport's statement of this week that it has not received any requests in respect of any flight to Israel. No request does not mean no bombs. THE United States used Shannon airport to transport Apache attack helicopters for use by Israel. The helicopters have been used in the past for targeted assassinations of militants. In February a cargo plane carrying three Boeing Apache helicopters, the type used by both the American and Israeli forces, landed at Shannon, where it stayed overnight before taking off for Israel. When contacted last month both the Department of Transport, which is responsible for foreign civilian flights, and the Department of Foreign Affairs, which is responsible for foreign military flights, denied any knowledge of the flight. This week, when presented with the serial numbers of the cargo planes and of the helicopters, they conceded the flights had taken place and said that they have launched an inquiry. Congrats on getting it up again! Delighted to see that Shannonwatch.org has been up again all day today. Keep up the good work! the landing of an unusual US military cargo plane at Shannon. a spokesman for the group, ShannonWatch. Phosphorous for the US military. that it lands on. It cannot be extinguished with water." melt flesh to the bone if it comes into contact with skin. Dynamics, and Ordnance and Tactical Systems. (www.shannonwatch.org) lahmgelegt. Inzwischen ist sie jedoch wieder in Betrieb. SO WHY DONT THEY BOMB LITTLE ROCK IN PINE WOOD THAT ARE MAKING THE WHITE PHOSPHOUROUS?I AGREE WHAT THEY ARE DOING IN PALESTINE IS HORRENDOUS AND ILLEGAL!CAN THE ARABS FORM AN ORDERLY QUE? ?ATTACK THE SOURCE??! LEAVE SHANNON OUT OF THIS!